The decisive terrain is the human terrain. The people are the center of gravity. Only by providing them security and earning their trust and confidence can the Afghan government and ISAF prevail. President Obama, for his part, has indicated a strong interest in improving U.S. detention operations and providing detainees due process. As a candidate, he applauded the U.S. Supreme Court’s decision granting Guantanamo detainees habeas corpus rights, calling it “a rejection of the Bush administration's attempt to create a legal black hole at Guantanamo” and “an important step toward reestablishing our credibility as a nation committed to the rule of law.” Early in his administration, he issued three separate executive orders aimed at improving U.S. detention policy and detainee treatment. And President Obama created a new Joint Task Force to oversee detention operations in Afghanistan and adopted specific new measures to improve detention practices there. Detention operations are tactical missions with broad-ranging strategic effects. As we separate those who use violence and terror to achieve their aims from the rest of the Afghan population, we must do so in a lawful and humane manner. We have an obligation to treat all Afghan citizens and third-country nationals (TCNs) with dignity and respect. Fulfilling this obligation strengthens our partnership with both the Government of the Islamic Republic of Afghanistan (GIRoA) and the Afghan people. Failure to fulfill this obligation jeopardizes public support for both the Coalition and the GIRoA. At the very least, these statements and actions imply a commitment by the United States to apply minimum international legal standards of due process to the 1700 or more prisoners now being held without charge or trial at the Bagram U.S. Air Base in Afghanistan. 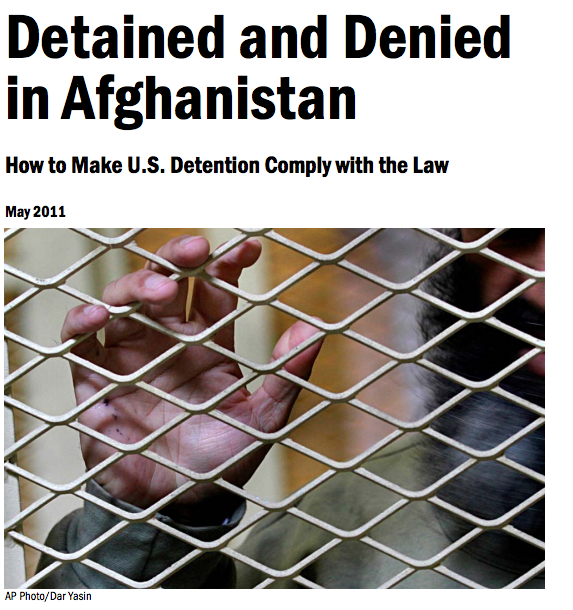 In February 2011, Human Rights First traveled to Afghanistan to determine whether the United States is providing due process to its prisoners there. This trip followed previous ones in recent years that had similarly examined the detention and trials of detainees imprisoned by the U.S. military at Bagram and made recommendations on how to improve the process. In this latest trip, we found that the U.S. system for determining who is legally detainable has improved since the completely secret process used during the Bush administration. Significantly, the Obama administration now allows detainees to attend at least a portion of a hearing and address a board of U.S. military officers. Each detainee is assigned a “personal representative” to help present his case, and is entitled to a new status hearing every six months. The military has also implemented some of the recommendations that Human Rights First made in its last report, such as allowing human rights organizations to observe detainee hearings; excluding evidence obtained through torture or cruel, inhuman or degrading treatment; and making efforts to improve the prosecution of national security detainees in Afghan courts. Nevertheless, based on our observations of proceedings, and interviews with former detainees and U.S. military personnel, we believe that the current system of administrative hearings provided by the U.S. military fails to provide detainees with an adequate opportunity to defend themselves against charges that they are collaborating with insurgents and present a threat to U.S. forces. As such, it not only falls short of the requirements of international law but erodes the critical efforts General Petraeus described as necessary to build trust and confidence among the Afghan people. Former detainees we interviewed repeatedly emphasized that they believed they were wrongly imprisoned based on false information provided to U.S. forces by personal, family or tribal enemies, a view that they took back to their villages after their eventual release. Afghan lawyers and human rights workers confirmed that this is a big problem in Afghanistan, as have recent news reports. Former detainees said that in the view of their families and communities, the United States is arbitrarily detaining people based on false intelligence. The result, they said, is an increasingly negative perception of U.S. forces. Moreover, as Major General Douglas Stone warned after investigating U.S. detention practices in Afghanistan in August 2009 for the U.S. Central Command, detaining moderate Afghans unnecessarily risks transforming them into radicals. General Stone, a U.S. Marine Corps reservist, reformed detainee operations in Iraq in 2007 and 2008. His 700-page report on U.S. detention in Afghanistan has never been publicly released. The United States claims the right to detain insurgents who “were part of, or substantially supported Taliban or al-Qaeda forces or associated forces that are engaged in hostilities against the United States or its coalition partners.” In the hearings Human Rights First observed, however, little to no evidence was presented, at least publicly, to support the conclusion that the detainees met this criterion. Not a single witness was called to testify in any of the hearings we observed. In some cases, the evidence against the detainee appeared to be as thin as a mere claim by U.S. soldiers that they found bomb-making materials in a house nearby. No public evidence was presented connecting the individual detainee to that house, or to the materials. In other cases, where the government claimed to have more specific evidence, such as explosive residue found on the detainee’s body or clothing, the evidence often raised more questions than it answered, such as whether the residue was found before or after detaining authorities showed the explosive materials to the detainee, and whether he handled them at that time. Yet those questions were never asked. In large part, that is because the detainees are not represented by legal counsel in these proceedings, known as Detainee Review Boards. The detainees’ “personal representatives” are uniformed U.S. soldiers with no legal background or training in the culture or language of the detainees they represent. Moreover, with only 15 such representatives assigned to Bagram at the time of this report, each representative is responsible for the defense of more than 100 detainees. The result, in the cases we observed, is that these representatives appeared to do little or nothing on behalf of the detainee. Although each is required to attend a 35-hour training course, none seemed to have independently investigated the case, collected evidence on the detainee’s behalf, demanded that the government produce evidence, or asked even the most obvious questions challenging the evidence that the government presented. It is possible that some of these questions were asked in a classified session, which neither the detainee nor Human Rights First was allowed to observe. But that in itself raises serious due process concerns. Even assuming that the government had strong classified evidence in each case to support continued detention of the detainee, the mere reliance on classified evidence detracts from the confidence in the process that the detainee being evaluated—and the people of Afghanistan—are entitled to have. Moreover, while most forensic evidence, which is more likely to be reliable, is not classified, evidence provided by informants, which is far more difficult to verify, is classified. These informants are never questioned or cross-examined in court, so their veracity is never tested. It is also impossible to know if the classified evidence includes statements elicited from the detainee or from witnesses by coercion, torture, or cruel, inhuman or degrading treatment, despite the military’s rule excluding tortured evidence. Such evidentiary rules can only be enforced if the evidence can be tested in a truly adversarial system. Finally, Human Rights First learned in Afghanistan that even some prisoners who have been recommended for release by the review board of soldiers conducting these hearings remain imprisoned by U.S. authorities. This problem is particularly prevalent for the approximately 41 non-Afghans incarcerated at Bagram. Of these, we believe that more than a dozen have been recommended for transfer or release (the U.S. government will not provide the precise number) yet remain at the U.S. prison. Another unspecified number of Afghans are in the same situation. Despite their responsibility to review all of the evidence, the Detainee Review Boards do not have final authority to order a prisoners release, even if the board determines that the individual does not pose a threat to U.S. forces. This violates international human rights law: the continued incarceration of these individuals is a classic case of arbitrary detention. The U.S. military now imprisons about ten times as many detainees in Afghanistan as it does at the military prison at Guantanamo Bay. The population of detainees at Bagram has almost tripled since 2008, reaching around 1700 detainees in March. More than 1300 suspects were arrested and imprisoned in 2010 alone, as compared to about 500 arrests in 2009. Bagram detainees are afforded far fewer rights than are those at Guantanamo. At Guantanamo, detainees have the right to challenge their detention in a U.S. court and to representation by a lawyer. At Bagram, detainees are given only rudimentary hearings. These hearings provide even fewer rights than did the Guantanamo Combatant Status Review Tribunals (CSRT) that the U.S. Supreme Court in 2008 declared inadequate to meet U.S. constitutional obligations. The result is that some detainees at Bagram have been imprisoned for eight years or more without charge or trial, based largely on evidence they have never seen and with no meaningful opportunity to defend themselves. Beginning this year, the United States plans to transition at least some of its detention authority to the Government of Afghanistan, and to help the Afghan government improve its detention system and the level of justice it provides to national security detainees. We welcome this development, and appreciated that the U.S. military invited us to observe an Afghan trial held at the Bagram Air Base with the assistance of the U.S. government. However, our observations at this Afghan trial, as well our conversations with Afghan lawyers and former detainees, reveal that the Afghan justice system is nowhere near providing a minimum level of due process in national security cases. Although detainees are represented by Afghan lawyers in these new Afghan trials held at Bagram, attorneys on both sides still produce little or no relevant evidence. And the judges may rely on secret evidence provided by the Afghan intelligence agency, the National Security Directorate (NDS). The assumption in the case we observed was that all NDS evidence, even if based on unnamed informants, is reliable. As the prosecutor in one case told the court, explaining why the judges should convict a man of membership with the Taliban: “NDS gave us this information. Why would they provide us with wrong information? They have no reason to.” The man was convicted, apparently based upon this secret information. Significantly, the United States has made clear that it intends to retain its detention authority for the indefinite future, even as it continues to transfer some prisoners to Afghan custody. The U.S. military therefore must provide its prisoners a meaningful opportunity to challenge their detention, notwithstanding Afghanistan’s future responsibility for this task. Indeed, doing so can help prepare for what will ultimately be a more successful transition to Afghan control of detention operations. Working together with Afghans now to improve the process in both U.S. and Afghan-led review proceedings will contribute to the development of a stable Afghanistan that abides by the rule of law and can resist a takeover by the Taliban or other insurgent forces. Other democracies that face grave security threats from terrorism, such as Israel, provide independent judicial review, a right to counsel, and appeals to suspected terrorists, and view these as required by international humanitarian law. We see no reason why the United States, which prides itself on respect for the rule of law and human rights, cannot meet the same standards.